In his newest film, French documentarian and cinema-essayist Chris Marker reflects on French and international politics, art and culture at the start of the new millennium. In November 2001, the filmmaker became intrigued, as did many other Parisians, by the sudden appearance of alluring portraits of grinning yellow cats on buildings, Metro walls and other public surfaces. 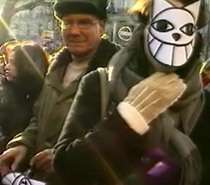 Marker's cinematic efforts to document the mysterious materializations of this charming feline throughout Paris are a recurring theme of THE CASE OF THE GRINNING CAT. This engaging record of Marker's cinematic peregrinations throughout the city, visually energized by his free-association montage style, chronicles strikes, demonstrations, memorials, election campaigns, celebrity scandals, international political incidents, and a seemingly endless variety of political protests (against the Iraq War, against China's occupation of Tibet, against the government's ban on the wearing of Muslim headscarves). The personalized commentary running throughout THE CASE OF THE GRINNING CAT offers the simultaneously learned and witty reflections of the filmmaker, now in his early eighties, on both the contemporary and historical implications of these varied events and personalities. The mysterious grinning yellow cats soon begin to appear amidst the banners and signs in some of the political demonstrations. 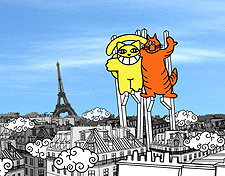 Eventually, the creator of the grinning cats is revealed to be an art collective known as Mr. Cat, whose members are shown painting a massive representation of their mascot on the plaza before the Pompidou Center. The filmmaker's own famous cat caricature soon allies with Mr. Cat, as Marker speculates on the political possibilities of such a feline association. 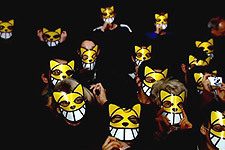 Chris Marker concludes THE CASE OF THE GRINNING CAT with thoughts on the vital importance of such expressions of imagination in our public lives, echoing the May '68 slogan that "La poésie est dans la rue" ("Poetry is in the street"). Five Chris Marker short films devoted to animals collected together and available for the first time! Noted French documentarian Chris Marker chronicles the history of the whale and, in a more general manner, that of all marine mammals, in the process warning of the imminent destruction of the whale threatened by the fishing industry's ongoing slaughter.